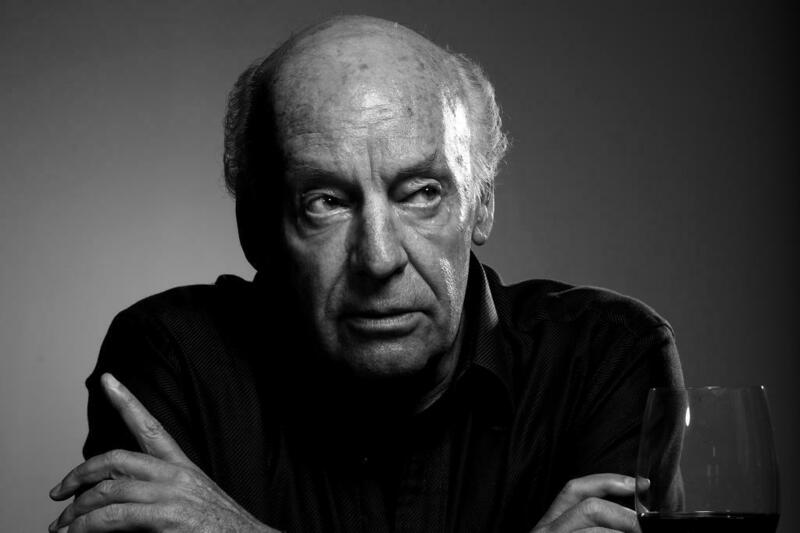 â€œThe voice of the numbersâ€� â€“ a metaphor by Eduardo Galeano. Writer and novelist. The data we explore could be like Egyptian hieroglyphs without a correct interpretation. Profiling is the very first step in a series of iterative stages in the pursuit of finding what the data want to tell us, if we are patient enough to listen. This chapter will cover, with a few functions, a complete data profiling. This should be the entry step in a data project, where we start by knowing the correct data types and exploring distributions in numerical and categorical variables. It also focuses on the extraction of semantic conclusions, which is useful when writing a report for non-technical people. What are we going to review in this chapter? freq(data): Categorical profiling (quantitative and plot). Note: describe is in the Hmisc package while remaining functions are in funModeling. The quantity of zeros, NA, Inf, unique values as well as the data type may lead to a good or bad model. Hereâ€™s an approach to cover the very first step in data modeling. First, we load the funModeling and dplyr libraries. Probably one of the first steps, when we get a new dataset to analyze, is to know if there are missing values (NA in R) and the data type. The df_status function coming in funModeling can help us by showing these numbers in relative and percentage values. It also retrieves the infinite and zeros statistics. 1.1.1.2 Why are these metrics important? Zeros: Variables with lots of zeros may not be useful for modeling and, in some cases, they may dramatically bias the model. NA: Several models automatically exclude rows with NA (random forest for example). As a result, the final model can be biased due to several missing rows because of only one variable. For example, if the data contains only one out of 100 variables with 90% of NAs, the model will be training with only 10% of the original rows. Inf: Infinite values may lead to an unexpected behavior in some functions in R.
Type: Some variables are encoded as numbers, but they are codes or categories and the models donâ€™t handle them in the same way. Unique: Factor/categorical variables with a high number of different values (~30) tend to do overfitting if the categories have low cardinality (decision trees, for example). The same reasoning applies when we want to remove (or keep) those variables above or below a certain threshold. Please check the missing values chapter to get more information about the implications when dealing with variables containing missing values. Missing values (NA) treatment, analysis, and imputation are deeply covered in the Missing Data chapter. Data type, its conversions and implications when handling different data types and more are covered in the Data Types chapter. Make sure you have the latest â€˜funModelingâ€™ version (>= 1.6). Frequency or distribution analysis is made simple by the freq function. This retrieves the distribution in a table and a plot (by default) and shows the distribution of absolute and relative numbers. 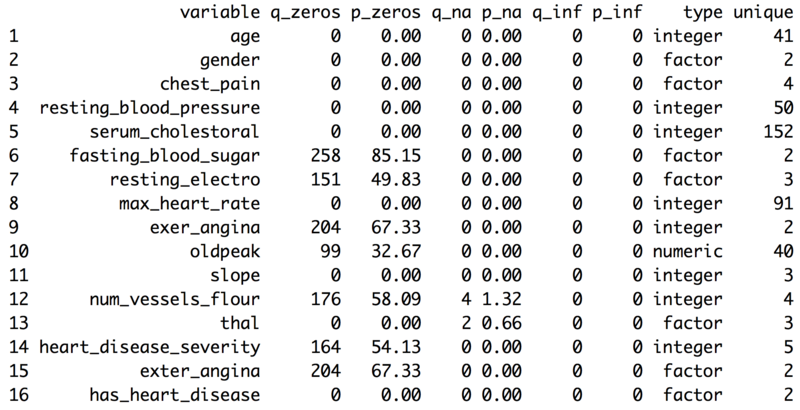 ##  "Variables processed: thal, chest_pain"
If only one variable is provided, then freq returns the printed table; thus, it is easy to perform some calculations based on the variables it provides. For example, to print the categories that represent most of the 80% of the share (based on cumulative_perc < 80). 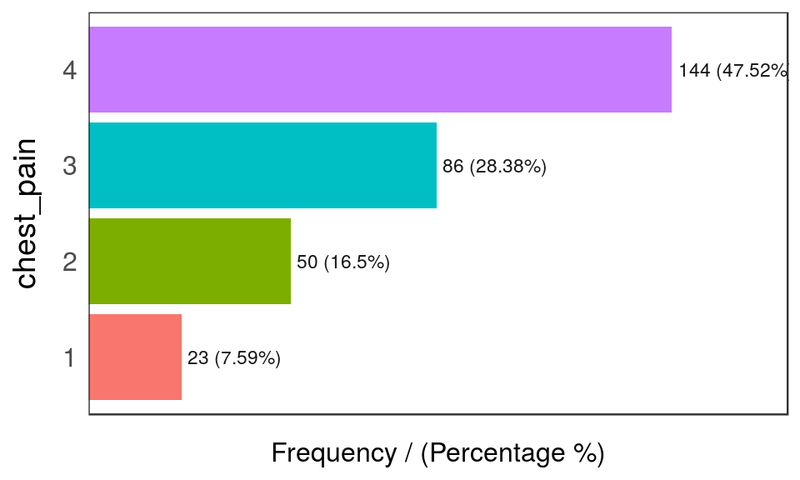 To get the categories belonging to the long tail, i.e., filtering by percentage < 1 by retrieving those categories appearing less than 1% of the time. In addition, as with the other plot functions in the package, if there is a need to export plots, then add the path_out parameter, which will create the folder if itâ€™s not yet created. The output is ordered by the frequency variable, which quickly analyzes the most frequent categories and how many shares they represent (cummulative_perc variable). In general terms, we as human beings like order. If the variables are not ordered, then our eyes start moving over all the bars to do the comparison and our brains place each bar in relation to the other bars. Generally, there are just a few categories that appear most of the time. This function comes in the Hmisc package and allows us to quickly profile a complete dataset for both numerical and categorical variables. In this case, weâ€™ll select only two variables and we will analyze the result. n: quantity of non-NA rows. In this case, it indicates there are 301 patients containing a number. missing: number of missing values. Summing this indicator to n gives us the total number of rows. unique: number of unique (or distinct) values. The other information is pretty similar to the freq function and returns between parentheses the total number in relative and absolute values for each different category. If you donâ€™t want to know how the data preparation stage from Data World is calculated, then you can jump to â€œPart 2: Doing the numerical profiling in Râ€�, when the profiling started. First, we have to do some data wrangling. We are going to keep with the newest value per indicator. # Excluding missing values in Series.Code. The data downloaded from the web page contains four lines with "free-text" at the bottom of the file. # The magical function that keeps the newest values for each metric. If you're not familiar with R, then skip it. ##   Country.Name Country.Code X1990..YR1990. X2000..YR2000. X2007..YR2007. ##   X2008..YR2008. X2009..YR2009. X2010..YR2010. X2011..YR2011. ##   X2012..YR2012. X2013..YR2013. X2014..YR2014. X2015..YR2015. The columns Series.Name and Series.Code are the indicators to be analyzed. Country.Name and Country.Code are the countries. Each row represents a unique combination of country and indicator. Remaining columns, X1990..YR1990. (year 1990),X2000..YR2000. (year 2000), X2007..YR2007. (year 2007), and so on indicate the metric value for that year, thus each column is a year. There are many NAs because some countries donâ€™t have the measure of the indicator in those years. At this point, we need to make a decision as a data scientist. Probably no the optimal if we donâ€™t ask to an expert, e.g., a sociologist. What to do with the NA values? In this case, we are going to to keep with the newest value for all the indicators. Perhaps this is not the best way to extract conclusions for a paper as we are going to compare some countries with information up to 2016 while other countries will be updated only to 2009. To compare all the indicators with the newest data is a valid approach for the first analysis. Another solution could have been to keep with the newest value, but only if this number belongs to the last five years. This would reduce the number of countries to analyze. These questions are impossible to answer for an artificial intelligence system, yet the decision can change the results dramatically. The next step will convert the last table from long to wide format. In other words, each row will represent a country and each column an indicator (thanks to the last transformation that has the newest value for each combination of indicator-country). The indicator names are unclear, so we will â€œtranslateâ€� a few of them. # Get the list of indicator descriptions. Note: To understand more about long and wide format using reshape2 package, and how to convert from one to another, please go to http://seananderson.ca/2013/10/19/reshape.html. n: quantity of non-NA rows. In this case, it indicates 116 countries that contain a number. missing: number of missing values. Summing this indicator to n gives us the total number of rows. Almost half of the countries have no data. Info: an estimator of the amount of information present in the variable and not important at this point. Mean: the classical mean or average. Numbers: .05, .10, .25, .50, .75, .90 and .95 stand for the percentiles. These values are really useful since it helps us to describe the distribution. It will be deeply covered later on, i.e., .05 is the 5th percentile. lowest and highest: the five lowest/highest values. Here, we can spot outliers and data errors. For example, if the variable represents a percentage, then it cannot contain negative values. The next function is profiling_num which takes a data frame and retrieves a big table, easy to get overwhelmed in a sea of metrics. This is similar to what we can see in the movie The Matrix. Picture from the movie: â€œThe Matrixâ€� (1999). The Wachowski Brothers (Directors). The idea of the following table is to give to the user a full set of metrics,, for then, she or he can decide which ones to pick for the study. Note: Every metric has a lot of statistical theory behind it. Here weâ€™ll be covering just a tiny and oversimplified approach to introduce the concepts. std_dev: standard deviation, a measure of dispersion or spread around the mean value. A value around 0 means almost no variation (thus, it seems more like a constant); on the other side, it is harder to set what high is, but we can tell that the higher the variation the greater the spread. Chaos may look like infinite standard variation. The unit is the same as the mean so that it can be compared. variation_coef: variation coefficient=std_dev/mean. Because the std_dev is an absolute number, itâ€™s good to have an indicator that puts it in a relative number, comparing the std_dev against the mean A value of 0.22 indicates the std_dev is 22% of the mean If it were close to 0 then the variable tends to be more centered around the mean. If we compare two classifiers, then we may prefer the one with less std_dev and variation_coef on its accuracy. p_01, p_05, p_25, p_50, p_75, p_95, p_99: Percentiles at 1%, 5%, 25%, and so on. Later on in this chapter is a complete review about percentiles. 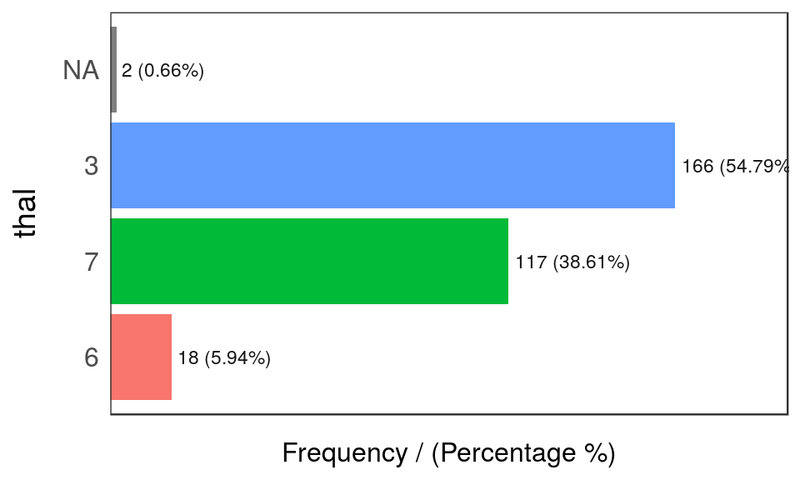 For a full explanation about percentiles, please go to: Annex 1: The magic of percentiles. kurtosis: describes the distribution tails; keeping it simple, a higher number may indicate the presence of outliers (just as weâ€™ll see later for the variable SI.POV.URGP holding an outlier around the value 50 For a complete skewness and kurtosis review, check Refs. (McNeese 2016) and (Handbook 2013). iqr: the inter-quartile range is the result of looking at percentiles 0.25 and 0.75 and indicates, in the same variable unit, the dispersion length of 50% of the values. The higher the value the more sparse the variable. iqr, range_98 and range_80 are based on percentiles, which weâ€™ll be covering later in this chapter. Important: All the metrics are calculated having removed the NA values. Otherwise, the table would be filled with NA`s. The idea of profiling_num is to provide to the data scientist with a full set of metrics, so they can select the most relevant. This can easily be done using the select function from the dplyr package. In addition, we have to set in profiling_num the parameter print_results = FALSE. This way we avoid the printing in the console. Please note that profiling_num returns a table, so we can quickly filter cases given on the conditions we set. 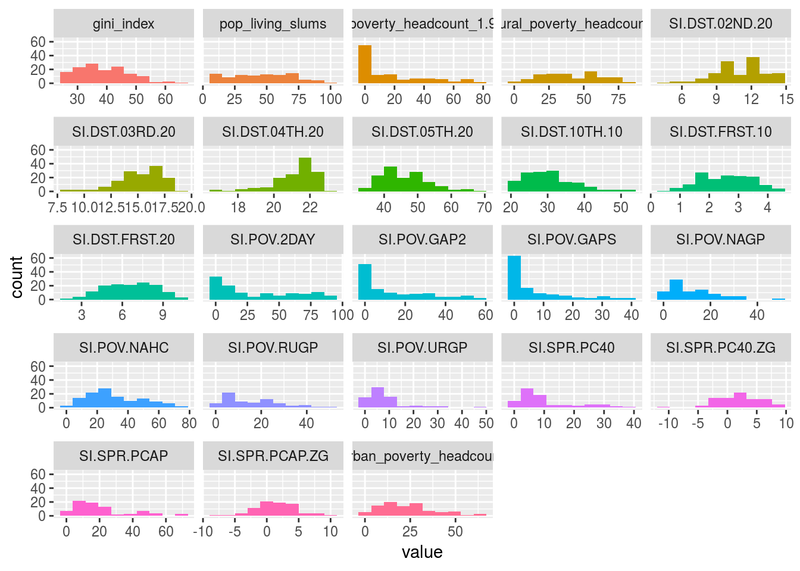 We can adjust the number of bars used in the plot by changing the bins parameter (default value is set to 10). For example: plot_num(data_world_wide, bins = 20). Many numbers have appeared here so far, and even more in the percentile appendix. The important point is for you to find the right approach to explore your data. This can come from other metrics or other criteria. The functions df_status, describe, freq, profiling_num and plot_num can be run at the beginning of a data project. Regarding the normal and abnormal behavior on data, itâ€™s important to study both. To describe the dataset in general terms, we should exclude the extreme values: for example, with range_98 variable. The mean should decrease after the exclusion. These analyses are univariate; that is, they do not take into account other variables (multivariate analysis). This will be part of this book later on. Meanwhile, for the correlation between input (and output) variables, you can check the Correlation chapter. 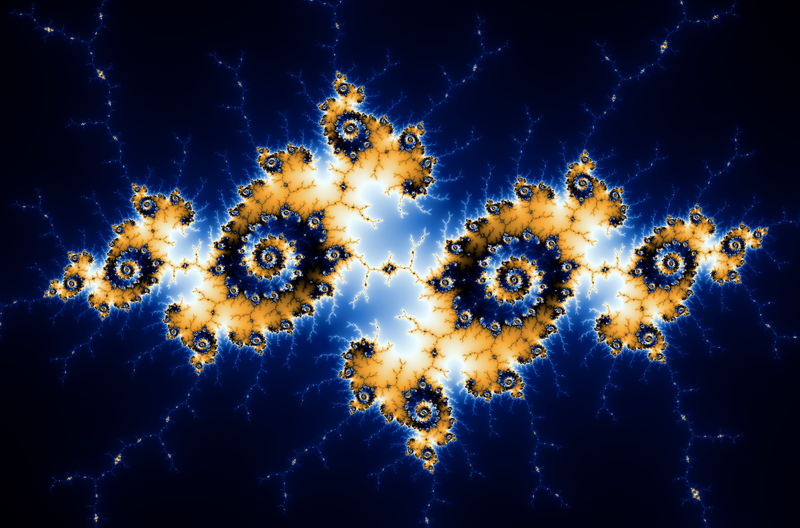 Manderbolt fractal, where the chaos expresses its beauty; image source: Wikipedia. This chapter contains both methodological and practical aspects of measuring correlation in variables. We will see that correlation word can be translated into â€œfunctional relationshipâ€�. 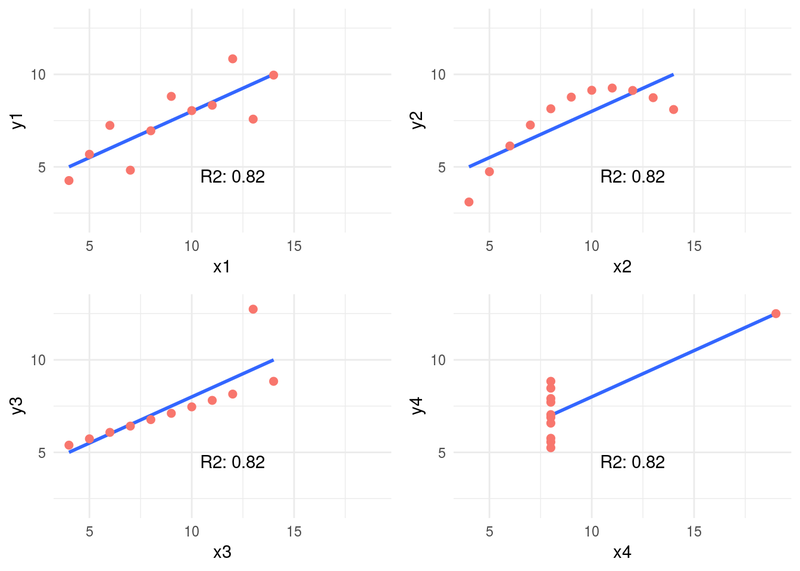 In methodological you will find the Anscombe Quartet, a set of four plots with dissimilar spatial distribution, but sharing the same correlation measure. Weâ€™ll go one step ahead re-calculating their relationship though a more robust metric (MIC). We will mention Information Theory several times, although by now itâ€™s not going to be covered at the mathematical level, itâ€™s planned to. Many algorithms are based on it, even deep learning. Understanding these concepts in low dimension (two variables) and small data (a bunch of rows) allow us to better understand high dimensional data. Nonetheless, some real cases are only small data. From the practical point of view, youâ€™ll be able to replicate the analysis with your own data, profiling and exposing their relationships in fancy plots. Letâ€™s starting loading all needed libraries. Perhaps the most standard correlation measure for numeric variables is the R statistic (or Pearson coefficient) which goes from 1 positive correlation to -1 negative correlation. A value around 0 implies no correlation. Consider the following example, which calculates R measure based on a target variable (for example to do feature engineering). Function correlation_table retrieves R metric for all numeric variables skipping the categorical/nominal ones. Variable heart_disease_severity is the most important -numerical- variable, the higher its value the higher the chances of having a heart disease (positive correlation). Just the opposite to max_heart_rate, which has a negative correlation. Squaring this number returns the R-squared statistic (aka R2), which goes from 0 no correlation to 1 high correlation. R statistic is highly influenced by outliers and non-linear relationships. They were constructed in 1973 by the statistician Francis Anscombe to demonstrate both the importance of graphing data before analyzing it and the effect of outliers on statistical properties. 1973 and still valid, fantastic. These four relationships are different, but all of them have the same R2: 0.816. Following example calculates the R2 and plot every pair. #every pair, every value is the same: 0.86. 4-different plots, having the same mean for every x and y variable (9 and 7.501 respectively), and the same degree of correlation. You can check all the measures by typing summary(anscombe_data). This is why is so important to plot relationships when analyzing correlations. Weâ€™ll back on this data later. It can be improved! First, weâ€™ll introduce some concepts of information theory. This relationships can be measure better with Information Theory concepts. One of the many algorithms to measure correlation based on this is: MINE, acronym for: Maximal Information-based nonparametric exploration. The implementation in R can be found in minerva package. Itâ€™s also available in other languages like Python. Letâ€™s plot a non-linear relationship, directly based on a function (negative exponential), and print the MIC value. # position [1,2] contains the correlation of both variables, excluding the correlation measure of each variable against itself. MIC value goes from 0 to 1. Being 0 implies no correlation and 1 highest correlation. The interpretation is the same as the R-squared. The MIC=1 indicates there is a perfect correlation between the two variables. If we were doing feature engineering this variable should be included. Further than a simple correlation, what the MIC says is: â€œHey these two variables show a functional relationshipâ€�. This is tricky because that relationship was effectively created based on a function, an exponential one. Noise is an undesired signal adding to the original one. In machine learning noise helps the model to get confused. Concretely: two identical input cases -for example customers- have different outcomes -one buy and the other doesnâ€™t-. Now we are going to add some noise creating the y_noise_1 variable. Calculating the correlation and MIC again, printing in both cases the entire matrix, which shows the correlation/MIC metric of each input variable against all the others including themselves. Adding noise to the data decreases the MIC value from 1 to 0.7226365 (-27%), and this is great! R2 also decreased but just a little bit, from 0.3899148 to 0.3866319 (-0.8%). 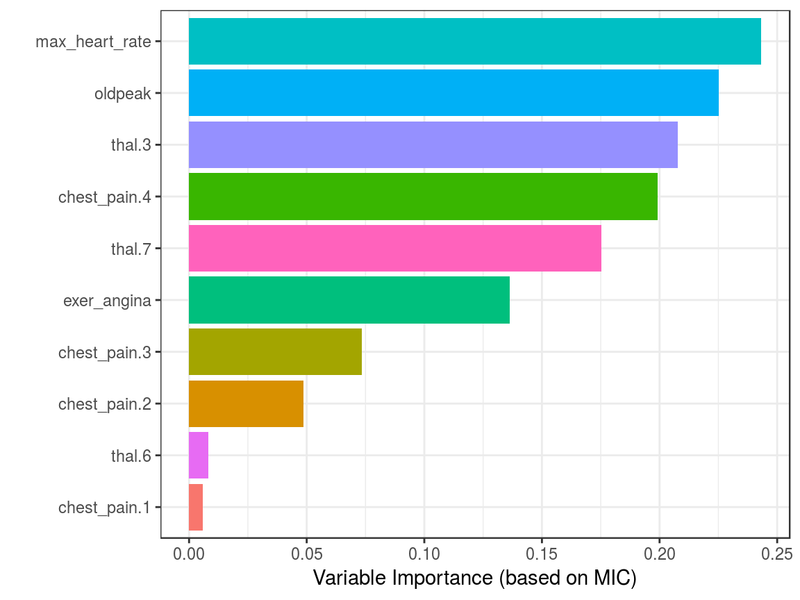 Conclusion: MIC reflects a noisy relationship much better than R2, and itâ€™s helpful to find correlated associations. About the last example: Generate data based on a function is only for teaching purposes. But the concept of noise in variables is quite common in almost every data set, no matter its source. You donâ€™t have to do anything to add noise to variables, itâ€™s already there. Machine learning models deal with this noise, by approaching to the real shape of data. Itâ€™s quite useful to use the MIC measure to get a sense of the information present in a relationship between two variables. mine function returns several metrics, we checked only MIC, but due to the nature of the algorithm (you can check the original paper (Reshef et al. 2011)), it computes more interesting indicators. Check them all by inspecting res_mine_2 object. One of them is MICR2, used as a measure of non-linearity. It is calculated by doing the: MIC - R2. Since R2 measures the linearity, a high MICR2 would indicate a non-linear relationship. Non-linear relationships are harder to build a model, even more using a linear algorithm like decision trees or linear regression. Imagine we need to explain the relationship to another person, weâ€™ll need â€œmore wordsâ€� to do it. Itâ€™s easier to say: â€œA increases as B increases and the ratio is always 3xâ€� (if A=1 then B=3, linear). Both plots show a perfect correlation (or relationship), holding an MIC=1. 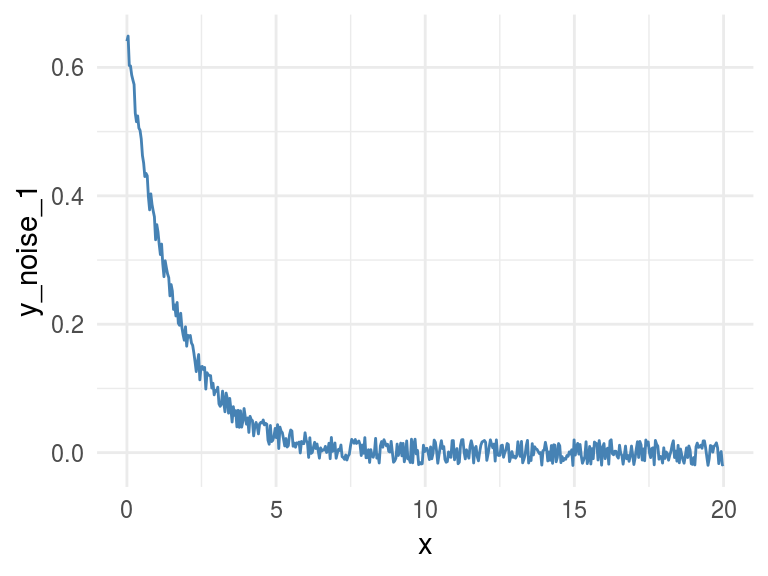 Regarding non-linearity, MICR2 behaves as expected, in y_exp=0.6101, and in y_linear=0. This point is important since the MIC behaves like R2 does in linear relationships, plus it adapts quite well to non-linear relationships as we saw before, retrieving a particular score metric (MICR2) to profile the relationship. Remember the example we review at the beginning? Every pair of Anscombe Quartet returns a R2 of 0.86. But based on its plots it was clearly that not every pair exhibits neither a good correlation nor a similar distribution of x and y. But what happen if we measure the relationship with a metric based on Information Theory? Yes, MIC again. As you may notice we increased the alpha value to 0.8, this is a good practice -according to the documentation- when we analyzed small samples. The default value is 0.6 and its maximum 1. In this case, MIC value spotted the most spurious relationship in the pair x4 - y4. Probably due to a few cases per plot (11 rows) the MIC was the same for all the others pairs. Having more cases will show different MIC values. # Calculating the MIC for every pair, note the "MIC-R2" object has the hyphen when the input are two vectors, unlike when it takes a data frame which is "MICR2". Ordering decreasingly by its non-linearity the results are consisent with the plots: 2 > 3 > 1 > 4. Something strange for pair 4, a negative number. This is because MIC is lower than the R2. A relationship that worth to be plotted. MINE can also help us to profile time series regarding its non-monotonicity with MAS (maximum asymmetry score). A monotonic series is such it never changes its tendency, it always goes up or down. More on this on (Wikipedia 2017b). Following example simulates two-time series, one not-monotonic y_1 and the other monotonic y_2. Consider the following case which contains three-time series: y1, y2 and y3. They can be profiled concerning its non-monotonicity or overall growth trend. We need to look at time column, so weâ€™ve got the MAS value of each series regarding the time. y2 is the most monotonic (and less periodic) series, and it can be confirmed by looking at it. It seems to be always up. 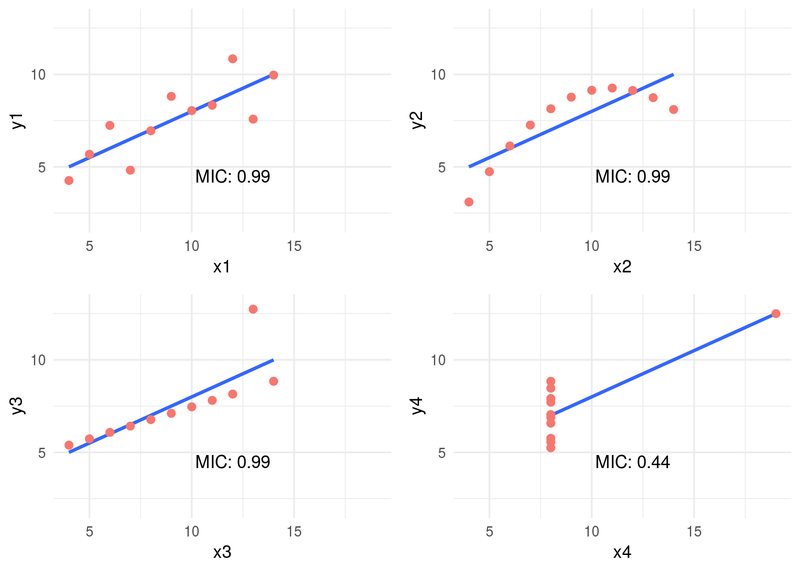 MIC metric can also measure the correlation in time series, it is not a general purpose tool but can be helpful to compare different series quickly. This section is based on the same data we used in MAS example. y1 is more similar to y3 (MIC=0.709) than what is y2 (MIC=0.61). MIC will not be helpful for more complex esenarios having time series which vary in speed, you would use dynamic time warping technique (DTW). 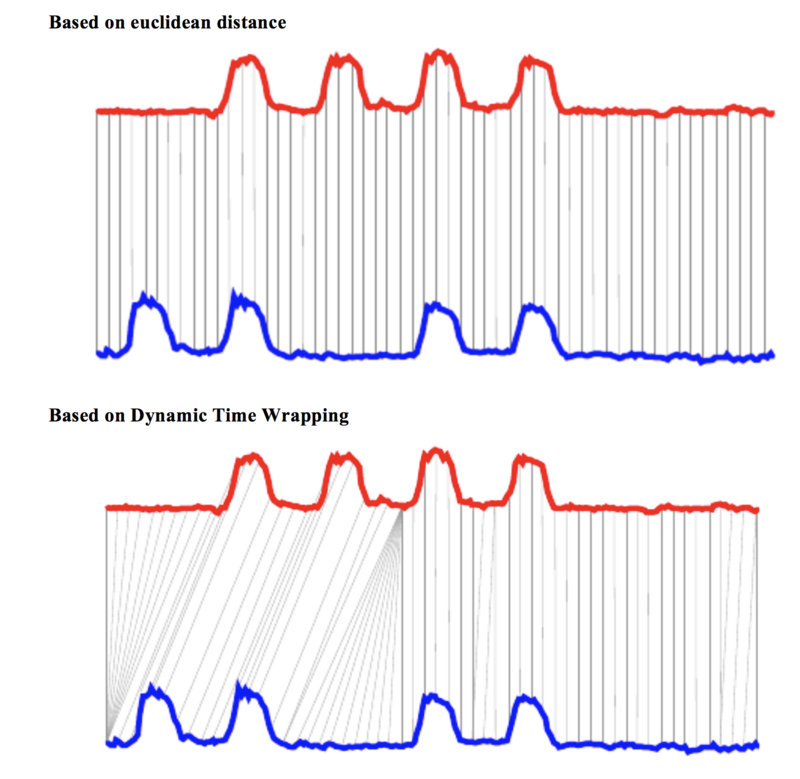 Image source: Dynamic time wrapping Converting images into time series for data mining (Izbicki 2011). The last image shows two different approaches to compare time series, and the euclidean is more similar to MIC measure. While DTW can track similarities occurring at different times. A nice implementation in R: dtw package. 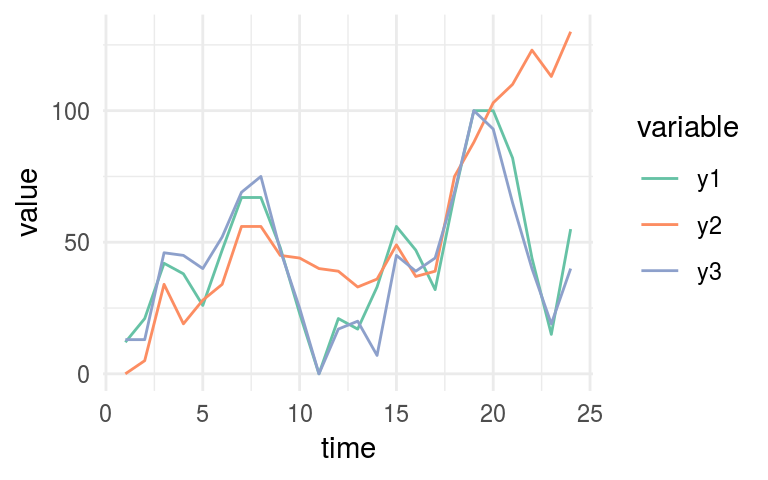 Finding correlations between time series is another way of performing time series clustering. MINE -and many other algorithms- only work with numerical data. We need to do a data preparation trick, converting every categorical variable into flag (or dummy variable). If the original categorical variable has 30 possible values, it will result in 30 new columns holding the value 0 or 1, when 1 represents the presence of that category in the row. # character for R) into numerical variables. # `Error: Missing values present in input variable 'x'. # is because data has missing values. # in this case it is not important. Where column thal.3 takes a value of 1 when thal=3. 1.2.9.1 Printing some fancy plots! 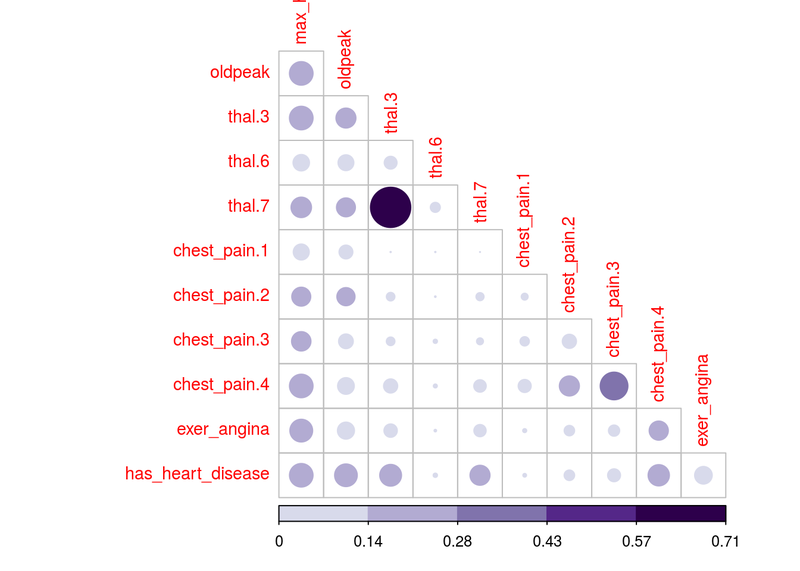 Weâ€™ll use corrplot package in R which can plot a cor object (classical correlation matrix), or any other matrix. We will plot MIC matrix in this case, but any other can be used as well, for example, MAS or another metric that returns an squared matrix of correlations. The two plots are based on the same data but display the correlation in different ways. # Correlation plot with circles. 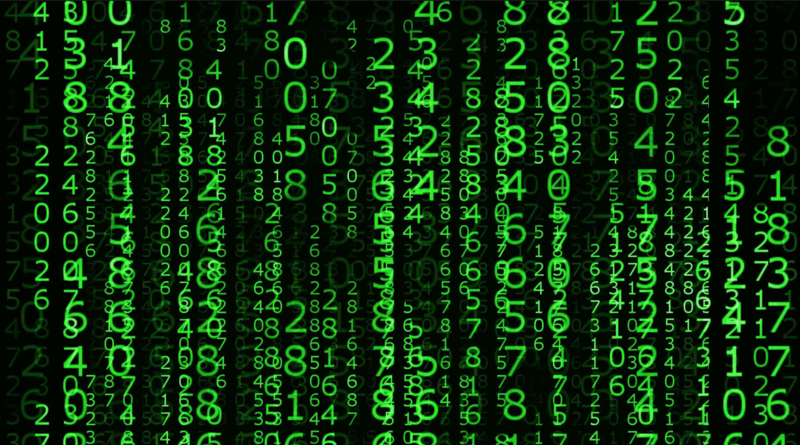 Just change the first parameter -mine_res_hd$MIC- to the matrix you want and reuse with your data. They are useful only when the number of variables are not big. Or if you perform a variable selection first, keeping in mind that every variable should be numerical. If there is some categorical variable in the selection you can convert it into numerical first and inspect the relationship between the variables, thus sneak peak how certain values in categorical variables are more related to certain outcomes, like in this case. 1.2.9.3 How about some insights from the plots? 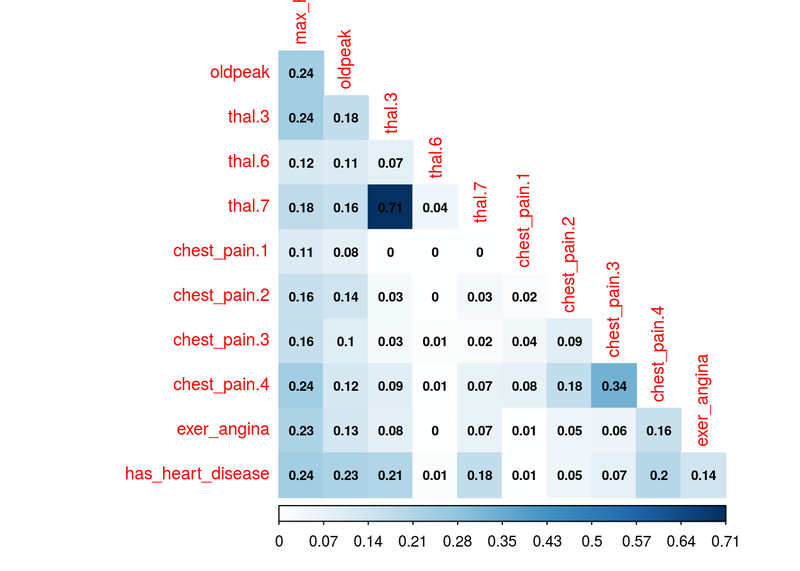 Since the variable to predict is has_heart_disease, it appears something interesting, to have a heart disease is more correlated to thal=3 than to value thal=6. Same analysis for variable chest_pain, a value of 4 is more dangerous than a value of 1. The likelihood of having a heart disease is 72.9% if the patient has chest_pain=4. 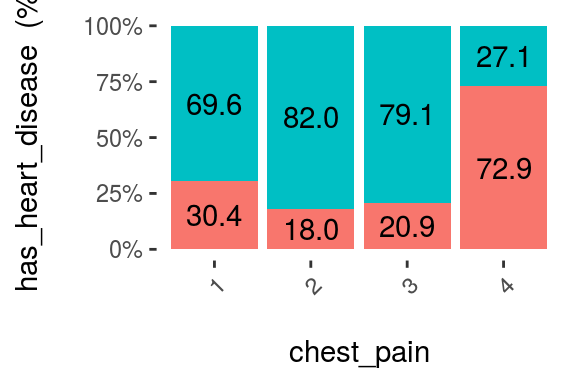 More than 2x more likely if she/(he) has chest_pain=1 (72.9 vs 30.4%). The data is the same, but the approach to browse it is different. The same goes when we are creating a predictive model, the input data in the N-dimensional space can be approached through different models like support vector machine, a random forest, etc. Like a photographer shooting from different angles, or different cameras. The object is always the same, but the perspective gives different information. Combining raw tables plus different plots gives us a more real and complementary object perspective. Based on MIC measure, mine function can receive the index of the column to predict (or to get all the correlations against only one variable). Although it is recommended to run correlations among all variables in order to exclude correlated input features. If it lasts too much time to finish, consider taking a sample. If the amount of data is too little, consider setting a higher number in alpha parameter, 0.6 is its default. Also, it can be run in parallel, just setting n.cores=3 in case you have 4 cores. A general good practice when running parallel processes, the extra core will be used by the operating system. No. We used only MINE suite, but there are other algortihms related to mutual information. In R some of the packages are: entropy and infotheo. Package funModeling (from version 1.6.6) introduces the function var_rank_info which calculates several information theory metrics, as it was seen in section Rank best features using information theory. 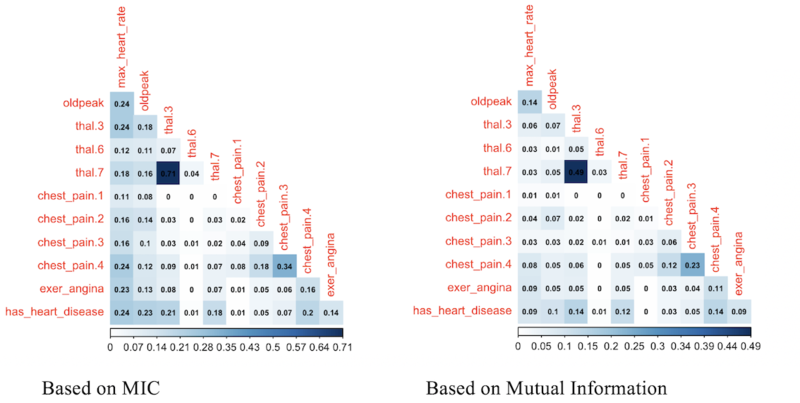 In Python mutual information can be calculated through scikit-learn, here an example. The concept transcends the tool. This time weâ€™ll use infotheo package, we need first to do a data preparation step, applying a discretize function (or binning) function present in the package. It converts every numerical variable into categorical based on equal frequency criteria. Next code will create the correlation matrix as we seen before, but based on the mutual information index. # Correlation plot with color and correlation Mutual Information from Infotheo package. This line only retrieves the plot of the right. Correlation score based on mutual information ranks relationships pretty similar to MIC, doesnâ€™t it? Further than correlation, MIC or other information metric measure if there is a functional relationship. A high MIC value indicates that the relationship between the two variables can be explained by a function. Is our job to find that function or predictive model. This analysis is extended to n-variables, this book introduces another algorithm in the selecting best variables chapter. Some predictive models perform better than other, but if the relationship is absolutely noisy no matter how advance the algorithm is, it will end up in bad results. Anscombeâ€™s quartet taught us the good practice of getting the raw statistic together with a plot. 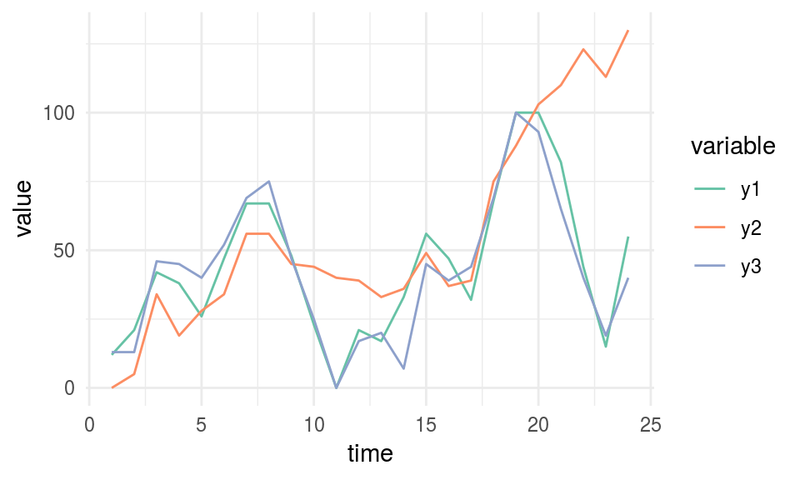 We could see how noise can affect the relationship between two variables, and this phenomenon always appears in data. Noise in data confuses the predictive model. Noise is related to error, and it can be studied with measures based on information theory such as mutual information and maximal information coefficient, which go one further step than typical R squared. There is a clinical study which uses MINE as feature selector in (Caban et al. 2012). These methods are applicable in feature engineering as a method which does not rely on a predictive model to rank most important variables. Also applicable to cluster time series. Wikipedia. 2017b. 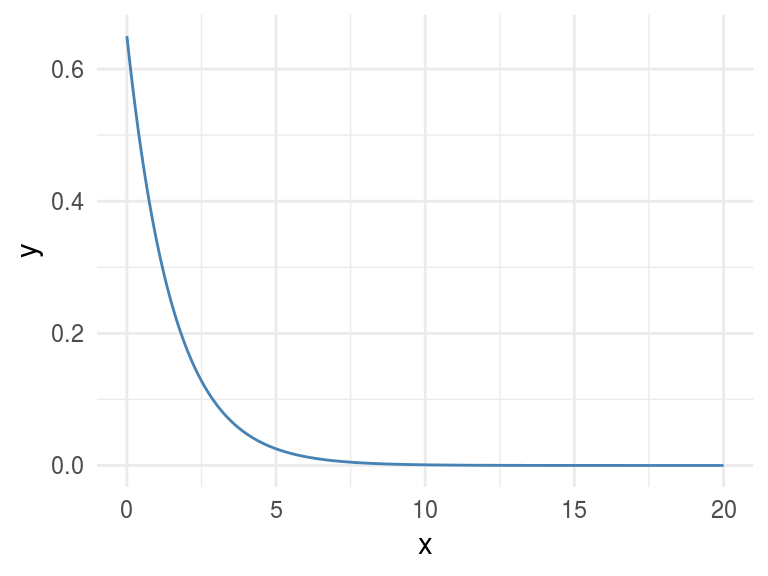 â€œMonotonic Function.â€� https://en.wikipedia.org/wiki/Monotonic_function.